On Nov. 23, 1867, Charles Vivian, Richard Steirly, Cool Burgess, Henry Vandemark & Hugh Dougherty played the first game of “Jolly Corks” at Sandy Spencer’s Bar at Broadway & Fulton in New York City. 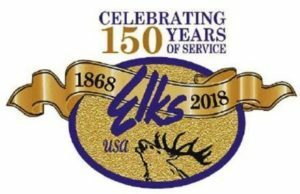 The “Jolly Corks,” the beginning of the Elks, lasted from Nov. 25, 1867, to Feb. 15, 1868, and included their founder, Charles Algernon Sidney Vivian and E.M. Platt, F. Langhorne, William Carleton, William Sheppard, Richard R. Steirly, John T. Kent, H. Vandemark, H. Bosworth and M.G. Ashe. On Feb. 16, 1868, the “Jolly Cork” members voting for “The Royal Antediluvian Order of Buffaloes” were C.A.S. Vivian, R.R. Steirly, M.G. Ash, H. Vandemark, H. Bosworth, Frank Langhorne and E.W. Platt. Voting for the name “Benevolent and Protective Order of Elks” were W.F. MacDonald, G.W. Thompson, T.G. Riggs, W. Carleton, W. Sheppard, G. Guy, H. Dougherty and W.L. Bowron. The name “ELKS” was chosen by a committee viewing an Elk head at Barnum’s Museum. On June 8, 1868, the first B.P.O.E. fund-raiser was held at the Academy Of Music at 14th Avenue and Irving Place in New York City. On March 20, 1870, the first Lodge of Sorrows was held for Brothers George E. Farmer and John W. Glenn; on the same date in 1880, the founder of the B.P.O.E., Charles Algernon Sidney Vivian, passed away of pneumonia in Leadville, CO.
On Feb. 12, 1871, Claude Goldie received a New York State Charter for the B.P.O.E.’s New York Lodge No. 1, and the first Grand Lodge meeting was called to order at 4:15 PM at 114-116 East 13th St. in New York City. In 1874 the B.P.O.E. instituted the position of District Deputy Grand Exalted Ruler. On May 31, 1889, the tragic Johnstown Flood killed 2000 people, and the B.P.O.E. began its tradition of helping American citizens with a donation of thousands of dollars for relief. In 1895 the BPOE was incorporated nationally. In 1896 the American Flag was added to the B.P.O.E. altar arrangement. On Feb. 18, 1898, GER Meade D. Detwiler of Harrisburg Lodge No. 241 (Harrisburg didn’t become Lodge No. 12 until 1904) secured the Elks first gavel, an ebony instrument made by “Jolly Cork” J. G. Wilton. On July 5, 1903, the present Elks emblem was adopted. The Alameda Elks Lodge No. 1015 was instituted on March 17, 1906. On April 18, 1906, the Great San Francisco Earthquake took place. Immediately following the earthquake, members of Alameda Elks set up a tent city for arriving families from SF on open land located at the cross streets of San Jose, Park Street and Oak Street. Members provided medical and dental services, daily meals, made sure all school age children were enrolled in classes and assisted in finding employment for all able bodied persons in the community. The Alameda Elks helped more than 5,000 people after the earthquake and, because of their generosity and the community’s welcoming spirit, more than 60% of that number remained and became residents of Alameda. On Sept. 30, 1908, PGER John K. Tener of the Charleroi Lodge umpired a spirited baseball game between a team from Greensburg Lodge No. 511 and the Boston Red Sox, led by Cy Young; the Elks won by 2 – 0. In 1919, the use of the “Eleven O’clock Toast” on occasions where non-Elks were present was given official Grand Lodge permission. In 1923, the Green Bay Elks Lodge held a benefit to raise money for the Green Bay “Packers” Football Club. On Sept. 8, 1946, the Elks Memorial was rededicated in Chicago, and the man who pulled the American Flag aloft that day was Brother John “Jack” Bradley of Appleton, WI, one of the marines who raised the American Flag at Mt. Suribachi in Iwo Jima. In 1970 the “Hoop Shoot” became an Oregon Elks state program. In 1972 was introduced nationwide. In 1976, GER George B. Klein dedicated Elks Hoop Shoot Plaque at Basketball Hall Of Fame.